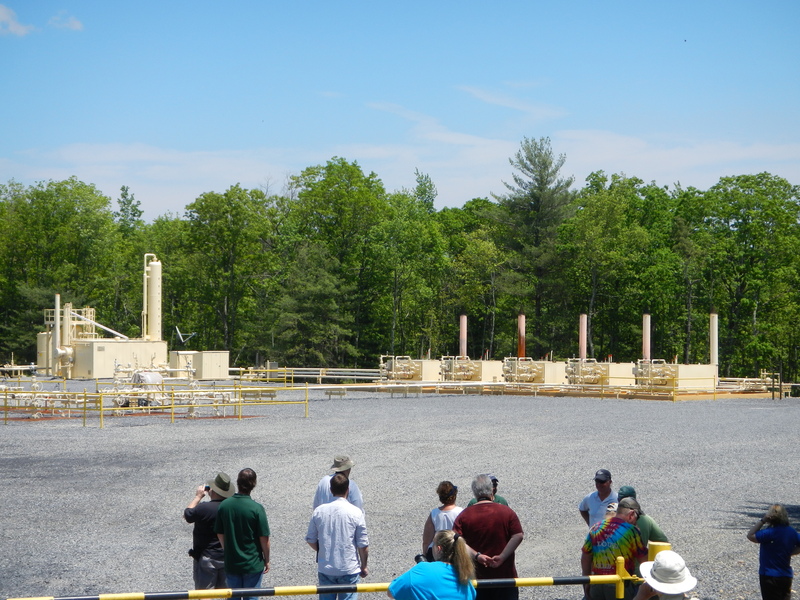 Day 2 of the NAGT-Eastern Section conference was dedicated entirely to a Marcellus Shale Field Trip. Despite knowing that temperatures were going to reach 90 degrees today, I was excited to get out to see what goes on at a drill site (well, at least I thought we were going to see some active drilling). Leave from the Best Western by bus for the Marcellus Shale Field Trip. Arrive a the Waterville facility of the PA Department of Conservation and Natural Resources (DCNR), with a tour of the building and a presentation by Arianne Proctor, Director of the Marcellus Program at DCNR. 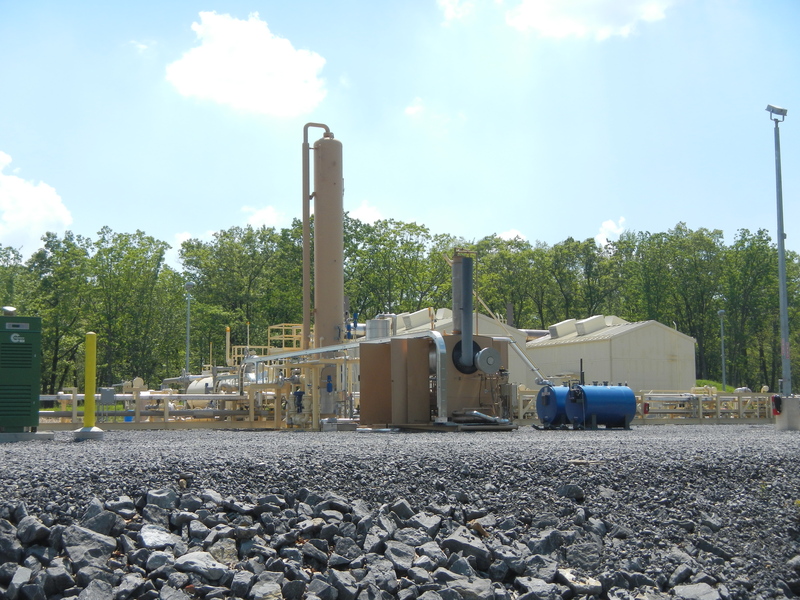 Then travel to a Marcellus Shale Drilling site. To jump ahead in my story, we did not get to visit an active drill site, with drillers using a drill rig. I was not the only person that thought this was what the trip would hold in store for us. Students, you know how I tell you to choose your words carefully when you are trying to describe something… using the phrase “drilling site” in the conference agenda made it sound as if we were going to visit a site with active drilling taking place. If the phrase was “former drill site” or “site of completed drilling” was used, I think fewer of us would have started the day with this misunderstanding. BUT, I have to give a shout-out to the people from PA DCNR at the Tiadaghton State Forest – Jeff Prowant (District Forester – Tiadaghton State Forest), Jeff Woleslagle (Division Chief of Communications), and John Piekara (Marcellus Program) – for leading an excellent program today. We started in their amazing “green” information center by learning about the PA Bureau of Forestry, how it was established in 1898, covers 2.2 million acres in PA, is present in 48 of 67 counties, and has over 5,000 miles of trails for public use. I also thought it was interesting to learn that the Tiadaghton State Forest is a working forest, harvesting and selling 14,000 acres of word annually with the trees not replaced/replanted with new growth but relying on natural regeneration. 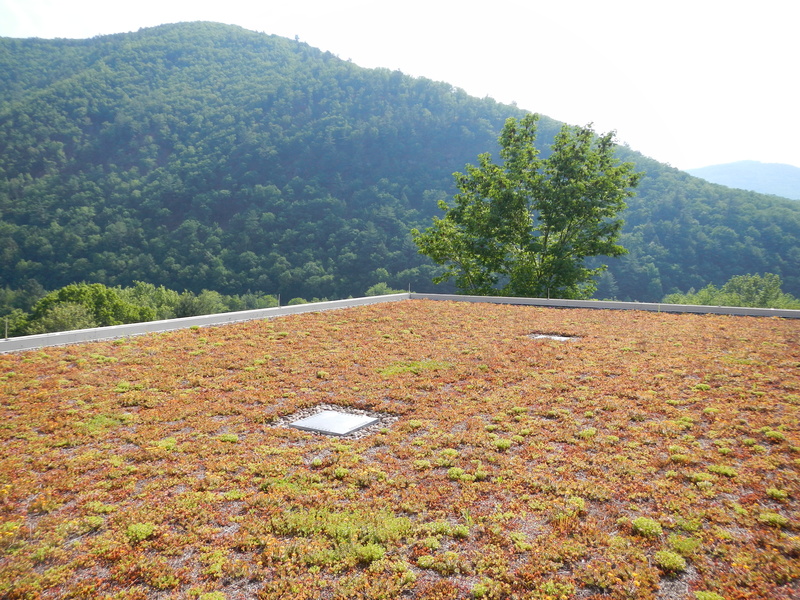 Looking out across the green roof at the Tiadaghton State Forest information center. 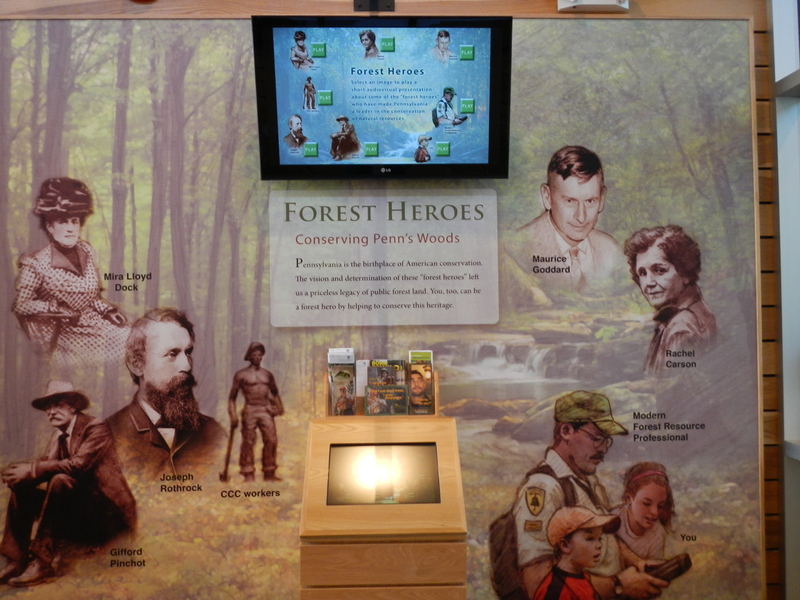 This was a great display to see in their visitor center – recognition to those that have made public lands in Pennsylvania possible. Students from my Earth Science “Fire” seminar will recognize some of these names! And we have former Penn State faculty member Maurice Goddard to thank for all of the state public lands that exist – because of Maurice, there is a state park in a radius of 25 miles, no matter where you are in Pennsylvania. I could fill this blog post with information about the Marcellus Shale and the drilling taking place on public lands. Certainly, this is a sensitive subject that everyone has an opinion on, whether they have all the facts or not. But I would rather fill this post with some of the photos I was able to take during our trip to sites around the forest. If you want to see an informative video by Marathon Oil on how the horizontal drilling takes place, this video is worth watching. The site where drilling is taking/has taken place is called a pad. 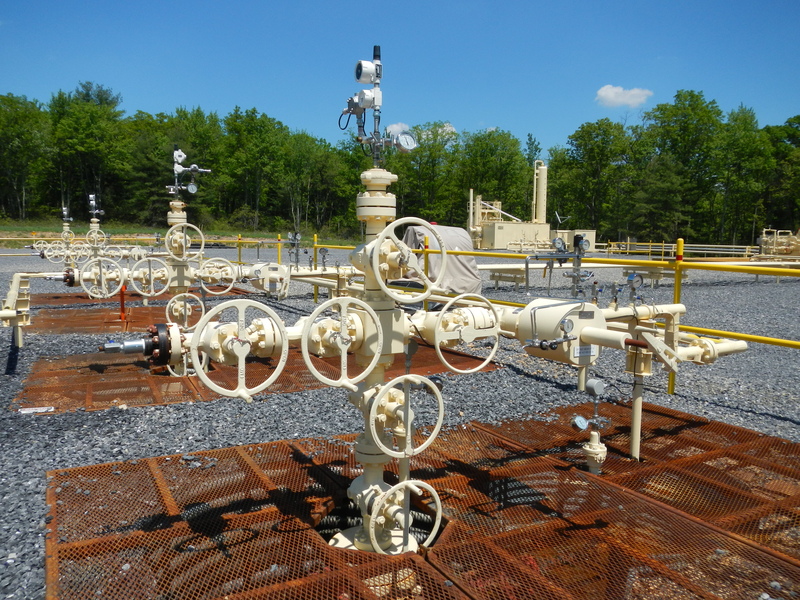 This site had five wells drilled (left side of image) that are now capped and allowing for the movement of natural gas. A closeup of the five wellheads that cap the drilled boreholes, nicknamed Christmas trees. I could not fit this entire 15 million gallon water storage pond in one photo frame, so I took a short panoramic video (see above). The bottom of the pond has a double liner with cables that run through it, so that if a tear occurs, the hole can be easily found and fixed. The fence around the outside is to keep curious bears away so they do not tear the plastic as well. The water comes from a local creek and is fed to the local drill sites. Each frac requires 3-5 million gallons of water, which is the equivalent of 1,000 one-way truck trips. This pond cuts down on some of the truck traffic. One of the sites where the waste water is treated and reused, or collected and transported away. I really appreciate the efforts of the State Forest System to make sure people have access to the information necessary for an educated and informed decision on gas development on state forest land. Of the 2.2 million acres of of state forests, 1.5 million acres are in the “main fairway,” meaning geographically located in areas with development potential, and 675,000 acres are available for development. With the Marcellus described as the largest shale play in the United States and possibly in the world, it is no wonder the drilling process and impacts are such a area of big interest and concern. I came up with some great ideas for case studies to include in future courses, with some nice photos to supplement my instruction. Stay tuned, future students! Tomorrow’s trip – off to the Pennsylvania Grand Canyon.